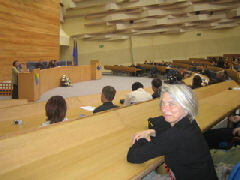 Marking ten years of peace in Bosnia and Herzegovina (BiH) in Autumn 2005, the United States spearheaded efforts - with European backing -- to reform the country's constitution. The amendments, debated for ten long months, sought to strengthen the BiH Council of Ministers and parliament as the international community contemplates its "exit strategy" after its decade-long presence. The current constitution is a complex Dayton legacy, which grants much power to the two entities, the Federation of Bosnia and Herzegovina (FBiH) and the Republika Srpska (RS). 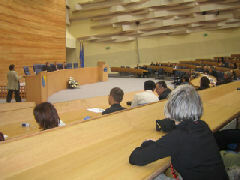 Much to the dismay of those in favour of amending the constitution, the lower house of the BiH central parliament rejected the proposals on 26 April 2006. Out of 42 members of the House of Representatives, 26 voted in favour, while 16 voted against. The adoption of the amendments required a two-thirds majority of those that were present and voted, which was 28 votes on that day. What does this imply for the country and the international community? Currently the two entities have extensive authority given the decentralized structure of government. This set up is not only extremely complicated but also financially inefficient in a country with already limited resources. The parliament vote suggests that constitutional reform will remain a debatable topic that needs further consultations, work and consensus-building. The OSCE Mission to BiH has never been directly involved in the hotly contested issue of constitutional reform. According to Ans Zwerver, Chef de Cabinet of the Head of Mission, the Mission followed the discussions over the past few months with great interest: "We have often underlined the need for efficient, effective and affordable institutions. We welcomed and supported the process of debating the constitutional changes but at the end it is up to the citizens and their leaders to design and implement the actual changes". The Mission's efforts to this end have focused on a Legislative Support Programme (LSP) designed to provide the central government with technical, logistical and expert assistance. 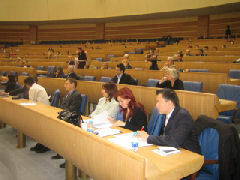 The primary focus of LSP is to support the BiH Parliamentary Assembly (PA) in institutional development. The Mission approach is based on the idea of sustainability and PA ownership of the strengthening programme. LSP is funded by the US Agency for International Development and will be implemented by the Democratization Department of the Mission for the next two years. 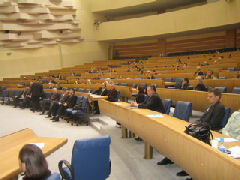 In the run up to the vote in the lower house, LSP partnered with the parliament, responsible for hosting a public debate on the issue before the vote. Public awareness and participation in the legislative process was not only a legal requirement to pass the constitutional amendments, but also a means of improving parliamentary outreach and strengthening the capacity of civil society to engage public officials. Dario Sikuljak is a National Parliamentary Officer working on LSP at the Mission. 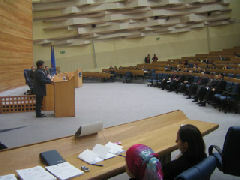 He describes the project: "LSP provided technical support for the parliamentary proceedings by publishing the constitutional amendments in three daily newspapers, airing a radio jingle on five stations to announce the debate, writing a transcript of the latter, transporting the participants to the main public hearing in Sarajevo and giving technical advice to the Parliamentary Committee that organised the debate." Sikuljak further explains: "The Parliamentary Assembly asked for our assistance because it was a high-level event and short notice was given. The Assembly lacked information technology, support staff and resources to individually facilitate this event. Consequently, we partnered with the services of the Assembly and spent ten intense days organising the event for 300 people". 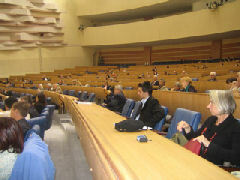 The public debate took place in the modern parliament hall in Sarajevo on 12 April, 2006. Comments ranged from demands to abolish the entities, due to their financial drain on the country, to ramifications of the amendments on the national economic growth rate. Various parliamentary members, political leaders, NGO representatives and unaffiliated citizens seized the microphone to make comments in a hearing that lasted six hours. OSCE Mission staff attended the debate and noted that although almost all participants agreed that the present constitution needed to be changed, few expressed strong support for the proposals on the table. A division along party lines was also visible, with representatives of the various parties for and against the amendments taking the opportunity to reiterate their views. The fact that the vote did not pass implies that amendments have gone back to the drawing board. In the meantime, "LSP will continue to support the Parliamentary Assembly through its programme," explains Sikuljak. "The PA will be under increased pressure because the number of representatives will not increase yet the workload will, particularly as its mandate will soon end. The upcoming October elections will mark a major transition, with new parliamentarians arriving and former officials leaving". Is the constitutional debate over? No, but negotiations on constitutional amendments must wait until after the October elections. "This recent setback is not the end of the constitutional reform debate," believes Valery Perry from the OSCE Mission Head Office. "The citizens are increasingly realising that they do not get the basic quality services (education, roads, etc.) that other European citizens expect from their governments. The OSCE's ongoing efforts to encourage people to look at the issues, and how government at all levels can play a positive role in their lives, will help to prepare the groundwork for more productive constitutional reform talks in the future, as well as for a lasting citizen-government relationship that is intrinsic to every democratic state."